Terminus is a story where every main creative element (writing, acting, music, direction, etc) is just slightly off. None of the elements are particularly bad in themselves, but the cumulative effect produces a curiously static story that fails to impress. I want to love it, because I love Stephen Gallagher’s previous script, Warriors’ Gate, but Terminus is a very different story. Whereas Warriors’ Gate was an impressionistic tale with several different levels of meaning, Terminus has a very clear narrative drive. It could be that Gallagher was attempting to make a satirical point concerning the private company, Terminus Inc., who have a contract to process and cure people with Lazar’s disease. In the early 1980’s, the debate about private healthcare versus the NHS was rumbling on. Is Terminus Inc. a sideswipe at private healthcare providers? It’s possible, although it’s not particularly clear. What does seem clear is that Terminus is an incredibly inefficiently run company. If nobody is ever cured, surely people would eventually realise this and not continue to pay them and send their infected relatives? If they exist to make a profit then surely it would be in their interest to cure as many people as possible, but they don’t seem to have much success with this. Into this setup, come the Doctor and his companions. Just as the script is a little off, so none of the regulars is particularly well served by the story. It does start brightly though, with a well acted scene between Tegan and Turlough, Tegan is very suspicious about Turlough, rightly so as it turns out. They remain together for the remainder of the story, but once they’re on Terminus they do little of consequence and their importance to the narrative fades. Terminus is Nyssa’s final story and Sarah Sutton is moved a little more centre stage, but she’s much less effective when not partnered with Davison’s Doctor. Several stories this year saw Davison and Sutton teamed up, and they worked together very well, but Nyssa fades somewhat when she’s working with the drippy Olvir or the cuddly Garm. If you mention Olvir (Dominic Guard) then you have to mention fellow pirate Kari (Liza Goddard). Their appearance in episode one is memorable, but for all the wrong reasons. They’re supposed to be hardened space pirates, but the capes and boots somewhat negate this. Olvir’s lashings of mascara don’t help either. It’s tempting to suppose that they were two of the worst pirates ever, so their boss took the step of marooning them on the first spaceship he saw. 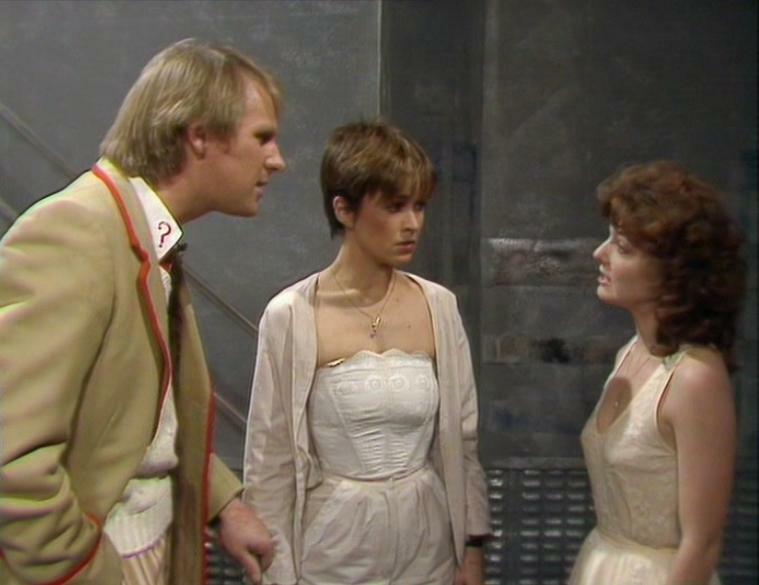 With Tegan and Turlough crawling around the infrastructure, achieving very little, and Nyssa waiting for a cure, that leaves the Doctor, who also has very little to do in the story. He spends a large part of it working on the mystery of the creation of the universe – but this is presented so baldly that there’s no particular interest generated. For example, when Davison announces (at the end of episode three) that the universe is in danger, it’s difficult to really care – it’s just a rather limp cliffhanger. 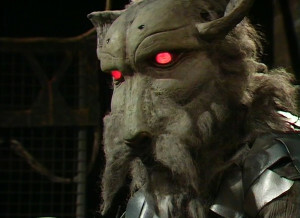 The Garm looks rather silly. Gallagher had intended that it should never be seen in full – only its silhouette and his glowing eyes – but he’s here, in all his shaggy-dog glory. And Roger Limb’s music is fairly horrific. I love the majority of the Radiophonic Workshop’s contributions during S18 – S23, but Terminus is the exception that proves the rule. Sounding rather like a series of random notes, it doesn’t create atmosphere, it merely irritates. There were numerous production problems with this story, which are fairly well documented and all these helped to contribute to the end result. But there are some highlights, like Peter Benson as Bor, who seems to be acting in a different story from everybody else. Terminus is a story that it’s difficult to imagine anybody ever reaches down from the shelf on impulse to watch. It’s one of those (like Underworld) that you struggle manfully through whilst engaged on a sequential rewatch and breathe a sigh of relief when it’s over and happier times (Enlightenment) are ahead.